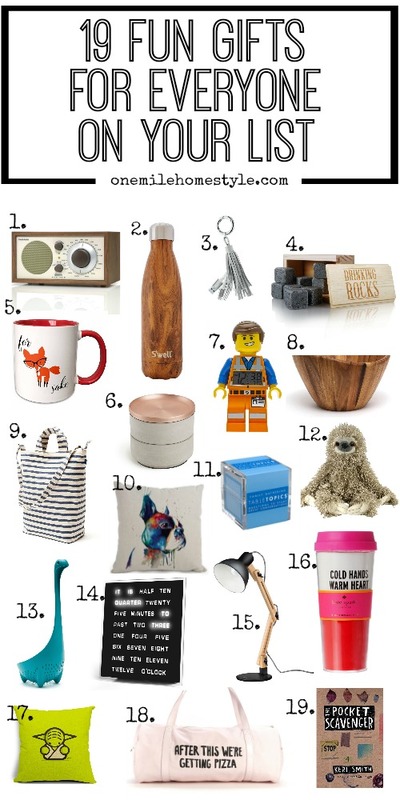 Ok guys, I went a little crazy with this gift guide, but it was so fun to put together! Really they are all fun to create (see them all here), so I hope they add a little fun to your shopping too! Unlike some of the other gift guides that follow a focused theme, farmhouse, DIY, navy and gold, this one is just a crazy random collection of fun finds that would be perfect for just about anyone on your list! 1. Bluetooth AM/FM Radio - I am loving the retro look of this radio, and it comes it a few different finishes that would be perfect in any home. 2. Teakwood Water Bottle - You can never have enough water bottles, and this fun wood look is not one you see everyday! 3. Tassel Key Ring Charging Cable - This little charging cable gadget would be so handy, and it's super cute too! 4. Drinking Rocks - Keep your drinks cold, and not watered down by adding a couple of frozen rocks instead of ice. 5. Fox Coffee Mug - I don't even drink coffee and I want this mug! It's funny and cute! 6. Concrete and Copper Jewelry Box - The unexpected mix of concrete and copper makes this jewelry box a beautiful gift for the jewelry lover! 7. Lego Alarm Clock - Know a kid with too many Legos? (I know two!) Here is the pefect Lego gift that doesn't come with 100s of pieces! 8. Large Wooden Bowl - What a perfect bowl for serving salads, or filling to the top as a display piece in the center of the table! 9. Striped Tote Bag - Tote bags are a staple accessory year round! And a good stripe will go with anything too! 10. Boston Terrier Pillow Cover - Lots of other options with this one, but Bostons are my favorite, and this bold pillow, is unique and fun. 11. Tabletopics Conversation Starters - Games that the entire family can enjoy are sometimes hard to find. This series looks like a lot of fun to find out more about your friends and family. 12. 3-Toed Sloth Toy - Who wouldn't love a fuzzy little sloth?! 13. Nessie Spoon - Yes! Seeing Nessie sticking out of a pot on the stove is sure to make cooking dinner fun! 14. LED Word Clock - This is a fun twist on a traditional clock, that would be perfect in an office, or in the family room. 15. Swing-Arm Desk Lamp - A versitile lamp that would be right at home in any room in the house. Simple, clean lines make a statement without being overpowering. 16. Cold Hands Mug - Cold weather means hot drinks, and a fun travel mug makes a dreary day a little brighter! 17. Yoda Pillow Cover - Star Wars is everywhere, and this minimalist pillow cover, the best, it is! 18. Gym Bag - My thoughts exactly after working out! Share this awesome gym bag with the fitness enthusiast in your life! 19. The Pocket Scavenger - A fun book for all ages, and there are even more similar books by this author that encourage you to work your way through the book and make your own story. Want even more gift guides? You can find them here.